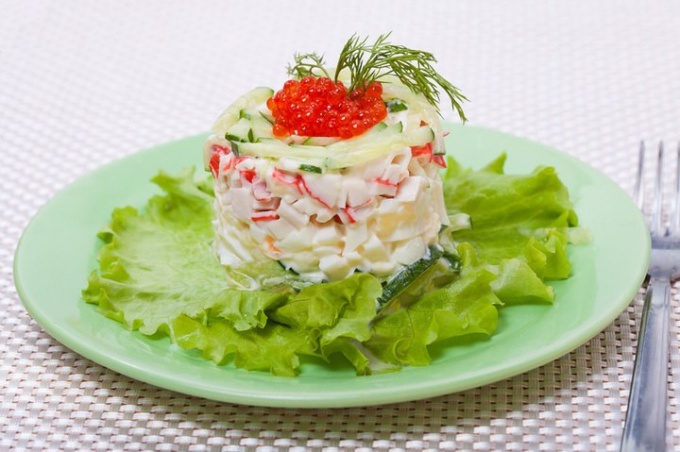 Crab salad has long been a traditional dish of Russian feasts. No wonder, because to cook it simply and quickly, and buy products for it does not require large expenditures. In addition, the usual crab salad you can vary the other ingredients, creating new taste combinations. - 1 tablespoon of sour cream. Eggs boil hard boiled, peel the shell and cut into small cubes. Shift in a bowl, eggs and sweet corn, which pre-drain the liquid. Add to ingredients diced crab meat. In a separate bowl, mix the mayonnaise with sour cream and season the salad with the mixture. Store the egg salad it is recommended that no more than two days and in the refrigerator. - 250 g of mayonnaise. To salad turned out to be less high-calorie, mayonnaise can be completely replaced low-fat yogurt without any additives or at least low-fat sour cream. Boil the rice until tender in plenty of salted water, drain and let cool to room temperature. The eggs boil hard boiled and cut into cubes along with crab meat and cucumbers. Put all the ingredients in a salad bowl, add canned corn and chopped green onions. Fill it with mayonnaise just before serving so that the cucumbers did not have time to let the juice, can spoil the appearance of the dish. For this salad it is better to choose a head of cabbage that has a large amount of green leaves. Tender part of the leaves of the Beijing cabbage finely slice crosswise and add to salad bowl. Add diced crab meat and cucumber and canned corn. Combine mayonnaise with sour cream and add this dressing to the salad. All carefully mix, the sunflower, if necessary, and serve.